In the past few months I have written a great deal about creating Failover Clusters for Hyper-V virtual environments. In this video I will demonstrate how we take a regular virtual machine created in Hyper-V Manager and make it highly available. These settings ensure that the virtual machine files will be imported into the default locations for my cluster… because I have Cluster Shared Volumes enabled the virtual machine files will be placed into C:\ClusterStorage\Volume1. 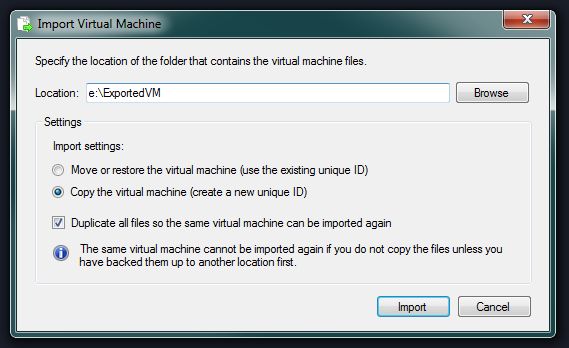 The settings also ensure that if I want to create multiple destination VMs from the same source files I can do so because it will create a new unique ID (UID) for the virtual machine. Once the virtual machine is in the proper location, I can now go through the steps required to make it highly available, as seen in the following video.